Sunday Quote!- Genesis 1-11 is Fiction? | J.W. Wartick -"Always Have a Reason"
Sunday Quote!- Genesis 1-11 is Fiction? I’m sure some of this statement was for rhetorical flourish, but it is clear that Sparks has chosen to contrast his position with the staunchest literalist position. He references the Flood as global; despite many conservative scholars arguing that it is local; in the same essay he sets his position against 6-day creationism, but does nothing to hint at how his position might contrast with those who do not adhere to that perspective. As I said, I’m sure a lot of this is rhetorical flourish rather than ignorance, but his essay could have been stronger if he’d interacted with more nuanced positions. That said, it is difficult to reconcile his statement that effectively nothing in Genesis 1-11 refers to a “literal account of events that actually happened…” with his statement that Genesis is the “word of God.” However, he does try to demonstrate this throughout his essay. I remain unconvinced that Genesis 1-11 is largely fiction, though I would find myself in agreement with Sparks at a few points in his exegesis. What do you think? Would arguing that Genesis 1-11 is effectively fiction–theological fiction, but fiction nonetheless–undermine its viability as the word of God? What might this mean for interpretation of these early chapters? 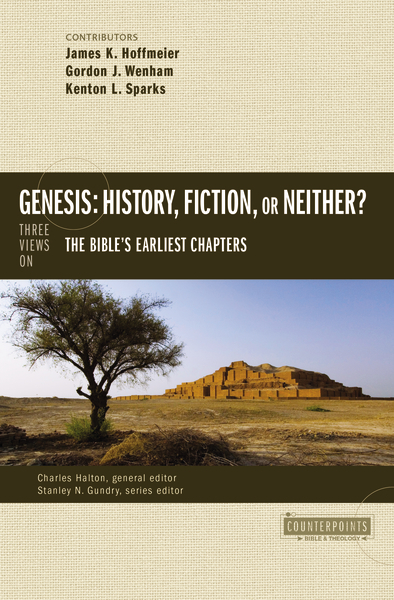 Kenton Sparks, “Genesis 1-11 as Ancient Historiography” in Genesis: History, Fiction, or Neither? Charles Halton and Stanley Gundry, eds. (Grand Rapids, MI: Zondervan, 2015). « Really Recommended Posts 8/21/15- Science Fiction, Debate the New Testament, and more! Funny! Having been an Atheist and believing the Bible was a mythological book, it is surprising to find so many believers in the message of it as also those who believe that it is exactly what I thought in years of folly, One exception was a fellow who studied myths, C.S. Lewis. Seems he thought the Book was not mythological. I tend to agree with him, having studied history in 10 colleges and universities. The lean prose of the Book is a dead give away that, while the work is theological, it is adhering to a standard of truth that far exceeds anything we can imagine. My main field of history was and is intellectual, the study of ideas. I find the Bible to be a work of such depth in way that is incomprehensible, that is, in its perspicuity as one old Puritan called it or its clarity as we would say today. Because it is so simple, so plain, so clear, we think we understand it and can classify it. The truth is otherwise or so it seems to me after over 55 years of study, research, five degrees and work on number six. No, I don’t think it undermines it’s viability. If we take the text as inspired, then seems like it shouldn’t matter what literary form it is. God can choose to use whatever form He sees fit to present truths, and it is still His word. It’s up to us to discern the form in order to correctly understand what He is saying. So whether or not the text is fiction doesn’t determine whether it is the word of God, but it does impact how we draw meaning from it. But I would go even further, and suggest that IF we were to think that such things had a bearing on the significance of the text, then being fictional would make it more significant, not less. Consider: most passages that describe God’s most direct communication are figurative in some sense. This was also true for the incarnate Word, for Jesus made great use of figurative means to describe spiritual truths. In other words, in His most direct communications, God seems to prefer using figurative techniques (and fiction would certainly qualify for such). Consider also how the natural world is described in Scripture with terms such as “temporary”, “image”, and “shadow”, while spiritual reality is described as “eternal”, “substance”, and “reality”. So given these things, I would say that a fictional (ie, figurative) description of the spiritual is more real, more significant, than literal historical narrative. Just the opposite of what the natural mind would expect. Is it? Jesus’ parables of the Good Samaritan or the Prodigal Son are not “literal accounts of events that actually happened,” and yet they are the Word of God. The Holy Spirit would have to be very limited in creativity, indeed, to never call upon and empower the artistic talents of storytellers and mythmakers — no less than poets, historians and epistle-writers — to communicate the Word. You always choose such thought-provoking quotes. Thanks for your blogging ministry! Thanks for stopping by, and I’m glad you enjoy the Sunday Quotes! I like how much discussion they bring forward. I did perhaps state a few things too strongly in this post, but it was a bit of a reaction to the way Sparks phrased his own chapter. The question is, however, whether you think that any hint of history or actually occurring events happened in Genesis 1-11. If so, then Sparks’ statement is too strong in some fashion. Apart from a little bit of poisoning the well–“It is no longer possible for informed readers” [emphasis mine]–he notes that throughout time Christians have thought of these as historic accounts. Rather than making a case for why none of it should be taken as historical, he pretty much just asserts that biology and other sciences have demonstrated this. But of course, the sciences have little to tell us about whether or not there was a man named Noah who experienced a flood. My point was just that the statement seems far too strong. Yes, your comment is fair enough. I hope mine did not seem like a salvo at you; it certainly wasn’t my intention. Sparks’ statement and yours simply knocked around in my mind for a bit, and there you have it. I agree: someone who accepts the stories as historical is not, by definition, uninformed. Personally, I do think the more I’ve learned about ancient world literature (I make no claims to be an expert), let alone science, the more difficult I, at least, have found it to accept them as “history” in our modern sense of the word. I do think there are some very, very bare bones of actual events somewhere way in the background of Genesis 1-11 as we have them, just as there are in many myths. Cataclysmic world flooding? Seems probable, even likely, given what we know from geology of the Earth’s formation. A civilization that tried to build a big ziggurat, but it all came tumbling down? Sure. An historic Adam and Eve – one man and one woman in a garden – I have a little less confidence about that, but it doesn’t shake my confidence in the story or its truths. “Was there really an Adam, was there really a Noah….” – these aren’t questions one asks of mythology. Anyway, I’m digressing from your point — which I do think is a solid one — to my soapbox again. Sorry, and thanks again for the blog. You raise good and difficult questions, well worth thinking about and discussing. The text contained in Gen 1-11 is written as a historical narrative. The fact that a creation begin to exist coupled with the fact that no logical, reasonable, naturalistic explanation, for it’s existence has ever been offered by the science community. Jesus and the Apostles / Authors of the New Testament believed Gen 1-11 was real history since they repeatedly quoted it, in context, never alluding to an allegorical of figurative interpretation. The parables Jesus used as teaching enhancements are clearly identified as such, as other figurative passages through out the Bible are either identified by the context, or clear statements. This whole discussion plays into the old /young earth debate. All the available evidence for creation / deluge is forensic in nature and must be interpreted by someone with a worldview influenced by a presupposition. In short, to whom will we as Christians ally with, a group of atheistic naturalists with multiple hypotheses, a group of liberal theologians who allegorically interpret everything written in the Bible, or God?